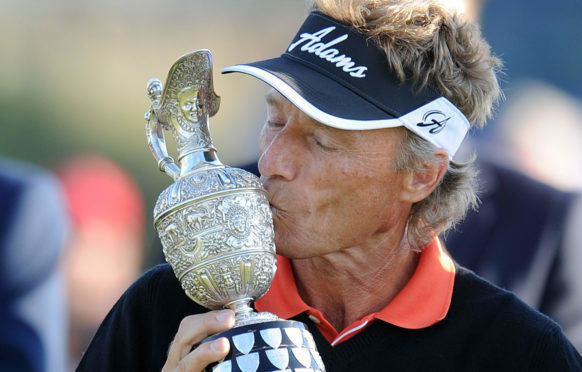 Bernhard Langer is the reigning Senior Open champion. The Senior Open presented by Rolex will be staged for the first time over the famous Old Course at St Andrews from July 26-29. And you can be there in person to witness history being made at the incomparable Home of Golf – then play the iconic links for yourself the following day, Monday, July 30, as part of the DC Thomson Team in the post-event Patrons’ Day. We are offering a priceless place in a fourball to tee off in front of the stunning Royal and Ancient Clubhouse once the dust has settled on Europe’s Senior Major, which will determine who succeeds reigning 2017 champion Bernhard Langer. Bask in the memories stirred by players such as Tom Watson, Sir Nick Faldo, Fred Couples, Colin Montgomerie and Langer, by following in their footsteps in the shadow of the grandstands the next morning. To whet your appetite for this challenge, you will also win two season tickets for the Championship, to watch a world class field packed with Major champions and Ryder Cup heroes as they pit their wits against a course which has witnessed many remarkable golfing tournament moments. That’s where you come in. To enter this superb competition, we would like you to tell us in 150 words maximum about your favourite memory of a tournament played on the Old Course. It could be recollections of an Open past, a Dunhill Links, Dunhill Cup or another memory of another wonderful championship played over the Old Course. Entrants must be in possession of an official handicap (maximum 24 men; 36 women). Winners must bring official handicap certificate.